the talk this time of year is all about bunnies and chicks, but i prefer elephants, specifically auspicious ones with their trunks raised. definitely porcelain ones filled with good tea. THIS is the teapot at Hank’s?? That is SO cool! I finally went there for lunch on Easter Monday: Moroccan lentil soup special. Yummy but the lentil skins *shakes head*, I can’t get past it. lentil skins? really? what about in dal? we should plan to do lunch at hanks the next time youre up for it. 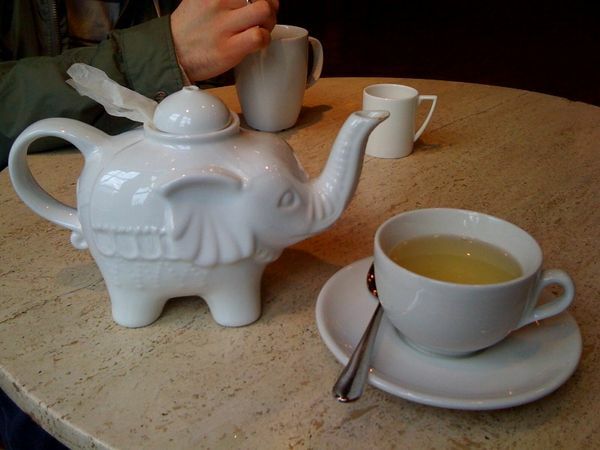 I have that very same teapot, purchased at Pantry! haha! I have that teapot too! I feel lucky every time I pour tea from it.